On the 19th of May, the network marked the World Day of Women’s Health with a gathering entitled “Now it’s my turn! Mental Health to Build Peace.” Held in the Congress of the Republic, its speakers included Nonie Reaño (Brahma Kumaris Community) and Clarisa Ocaña (a psychologist and specialist in gender and social politics). Five women who have worked on processes of comprehensive Women’s Development were honoured at this event. Among them was our sister, Margarita Recavarren Elmore rscj. The Bartolomé de las Casas Institute proposed this honour for Margarita in recognition of her valuable contribution in spreading a message of peace through her promotion of the development and empowerment of women in her community. 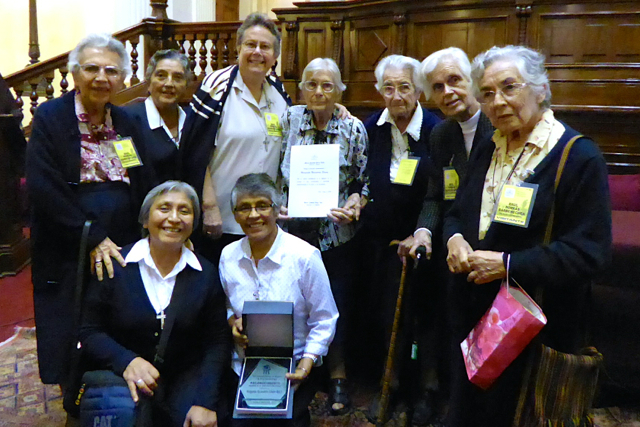 Margarita Recavarren Elmore rscj (standing, 4th from left) with RSCJ of the Province of Peru.